More often this summer than in years past, street art has been appearing all over the city and has turned an everyday walk into an open street gallery. Nevermind the concert posters you normally see at every intersection, overnight you'll find streets and complete city blocks pasted with stenciled and painted designs, most without any significant recognition of the designer's intent or identity beyond the familiar body of work. But of all we've seen this season, one has stood out beyond others all due to a woman's face. 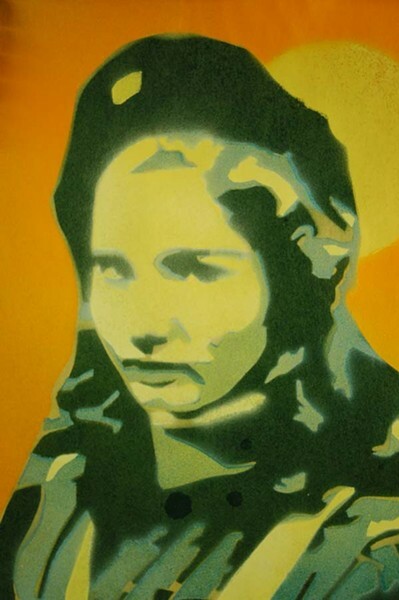 --- The series of portraits featuring a beret wearing Hungarian woman has attracted the attention of local artists and passers-by, as well as city cleanup crews who have apparently taken delight in swiftly removing them. 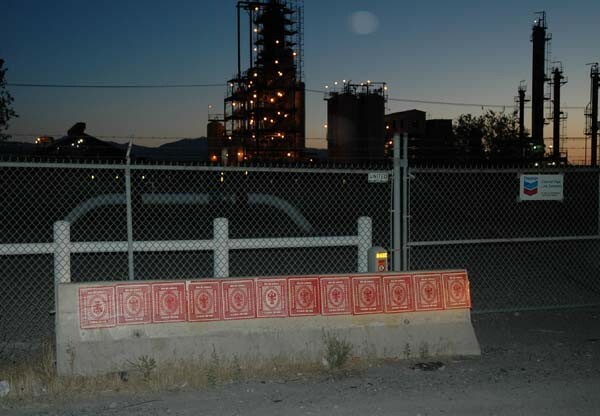 The series of murals and red on white stamps, titled Berg Propaganda by its creator, have had an interesting and confusing affect on the community. Some believing its a political statement, others leaning toward a more global outreach, and the rest just unsure what to make of it. To clear it all up we got a chance to chat with the mind behind the posters, going by the alias B3RG, to talk about his art career and the story behind his work. Plus his thoughts on local street art and our scene as a whole. Gavin: Hey man, first off, tell us a bit about yourself. B3RG: I am originally from good old Salt Lake City. I have been making art for as long as I can remember, one way or another. At a young age I developed a keen interest in the outside or alternative arts including graffiti and tattooing. Anything classified as "lowbrow", pop surrealism, or cartoon surrealism caught my attention and I collected as much of it as I could from magazines to books and photos. After high school I went to Boston for art school which I did not finish. Instead I returned to Salt Lake determined to make art for a living. I have been doing just that for the past several years. I love painting with spray paint and acrylics and spend way too much money at art stores. 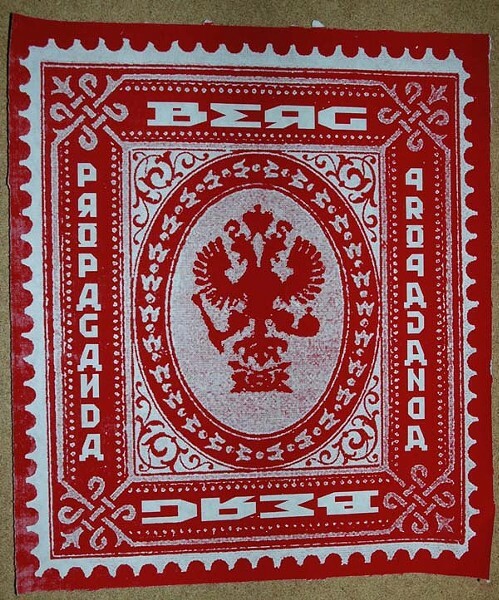 I am obsessed with the Russians, propaganda, street art, revolution, secret societies and cartoons. Gavin: How did you first take an interest in print and graffiti art? B3RG: I first got into graffiti when I was about 13, I ended up sitting next to the graffiti artist KAWS on a plane to New York and he told me all about his art and gave me some of his stickers. After that I was totally hooked and it led me to search out all different kinds of graffiti art and different ways of making art. In a way it showed me that there were people out there making a living doing art other than painting still life and landscapes. 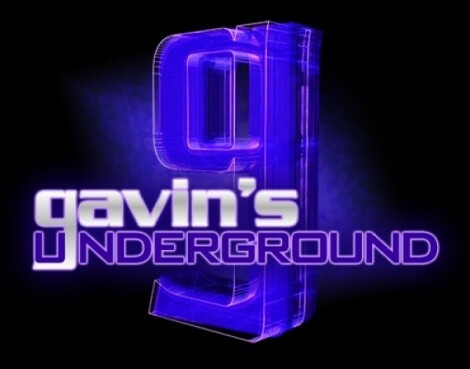 Gavin: Did you seek out any college in arts or are you more self-taught? B3RG: I spent a year in Boston going to an art school where I had access to graffiti walls, a screen print lab, tons of paint and countless other resources. I left Boston mostly due to the fact that art school is way too expensive for anyone planing to make art as a living after getting a degree. Essentially I decided with enough hard work I could learn whatever I wanted and if not there are always classes at universities or fellow artist out there to learn from. Gavin: What was it like for you first learning to post your art around and getting it seen by the public? B3RG: Learning how to make art for the streets is a total trial and error process. I have used glues to post stencils up that bubbled up and turned the surface into a horrible scab looking expansion foam nightmare. I tried cooking wheat paste which was another disaster, the bottles I filled with the paste began to expand and blew up in my back pack, leaving me without glue and a ruined backpack. After a few failures I have developed a method that seems to work the best and keeps the art up until the city cleans it off. 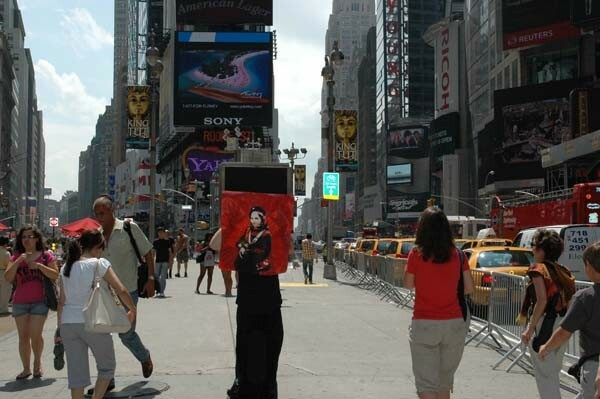 The biggest reward is going to see the posters the next day and watching people stop to check them out. 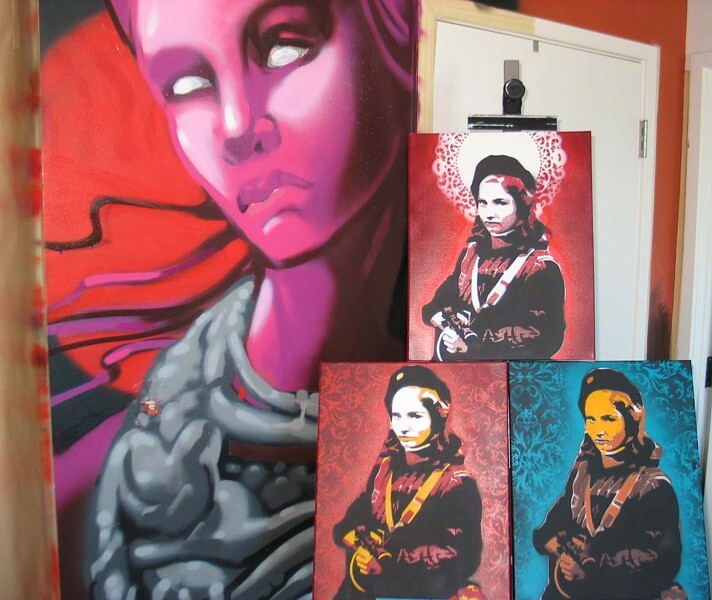 Gavin: With the different types of artwork you can do (graff, stencil, poster, etc), what's your personal favorite medium and why? B3RG: I really love a mix of mostly spray paint with details and highlighting done in acrylic paint. I started painting with acrylics because they dried so much faster than oil. I don't have the patience for oil, maybe that's my childhood ADD but I have always enjoyed a faster process of making art. The instant gratification of being able to cover a huge area with spray paint has always had a hold on me. 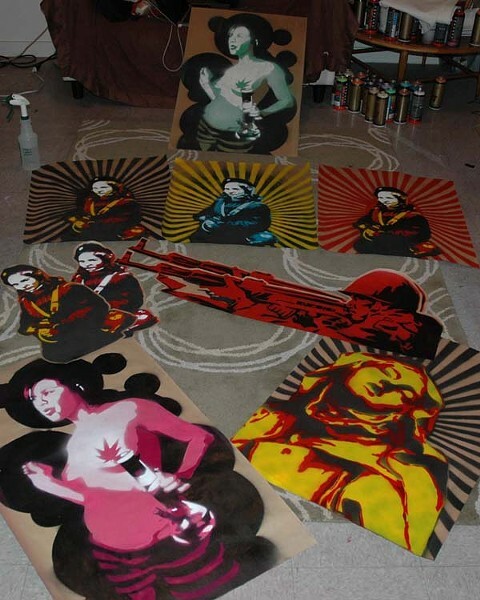 Making the stencils, posters and stamps meant that I had to create a separation between my art and my street art. So for now they exist independently. Gavin: How did the idea for Berg Propaganda come about? B3RG: I have a distant relation to the captain of the Titanic and it has been a connection I avoided... so instead of running from it, I adopted it as an obscure reference for making this type of anonymous art. The iceberg seemed to have some interesting implications and I like the way the letters flow together so it worked out. Its an obscure reference leaving unanswered questions, such is the point of the posters to a large extent. The concept of propaganda; the notion that art can be weaponized in an attempt to alter public opinion is very powerful and intriguing. Furthermore it exists in all cultures and groups of people, from world powers to freedom fighters and revolutionaries. 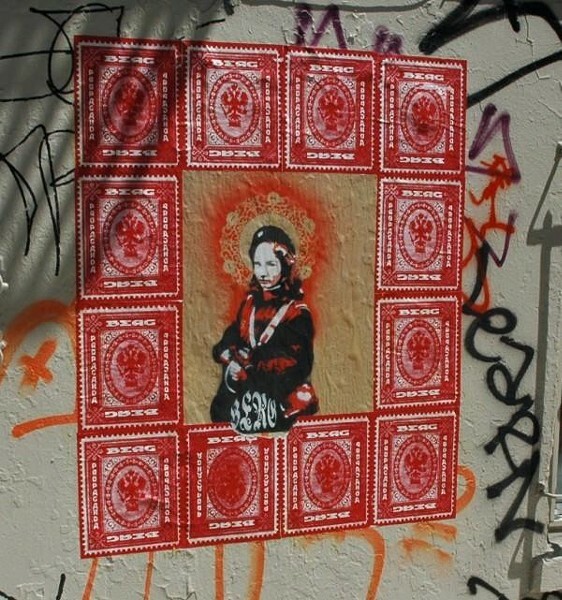 "Propagandaesque" art seems to be demanding of attention and that is the point of making art for the streets. Gavin: Where did you come across the designs of the girl and the red pattern you use? B3RG: I was asked by a modern dancer to make a few paintings for a dance she was doing inspired by the Hungarian revolution. She gave me a book to read on the revolution and I was totally stoked on the idea. I have been fascinated by revolution for as long as I can remember. The conditions that force people to stand up and take action against an oppressive force is a theme in life for me. Anyway, the book described one woman who's husband was killed during the revolution and she decided to take up arms and fight. The power of this action amazed me and her image seemed even more powerful. I had to use it for the paintings. From there it evolved into the basis for posters I wanted to share on the street in stencil form. The stamp I use is based on a few other obsessions that exist in my life. My dad has collected stamps my whole life and I have always loved the imagery on postage stamps. Its a form of art most people don't ever think twice about, just lick the back and stick it! Furthermore, I have an odd obsession with the Russians, something about their constant history of revolt and turmoil. So using and modifying an old Russian stamp to be posted all over town was something I just had to do. Gavin: Is there ever a plan behind where you end up placing stuff or is it completely random? B3RG: There is always some plan when it comes to placing posters. I want people who will appreciate them to see them so many locations are pre-planned. I try to concentrate on high traffic areas and places that are difficult to get to. A lot of the time, planning just goes down the drain and they get put up where the situation allows. Security guards, police and drunk people all play into the times the posters get placed randomly. Gavin: On occasion there's a statement or a question left behind with the work you've placed. Are you placing them as a political statement, or more as a way to provoke thoughts and open discussion? B3RG: When I can make a more complicated statement with my posters I will always take advantage of the situation. I feel that the basis behind the posters is a social question in some ways, "What will it take for your to get up and do something?" That is the reason for the image and the purpose for pasting the posters. In many ways I also like the unanswered question left behind, if people see them and it creates a conversation, that is a goal well achieved. Gavin: Have you yourself taken any flack from the city or observers, or have you managed to avoid being apart of your work with the alias? B3RG: I have had some close calls putting up posters. I had the cops stop me one time and I assured them that I was just hanging band posters, they left, maybe a little confused why I was using a bucket and roller instead of a roll of tape. On the other side, I have been on top of a ladder hanging a poster and had a car-full of people roll by and cheer on the process! Mostly I manage to stay separate from the work and simply notice when the city removes posters and try to make sure another one goes up in its place. Gavin: What's are the responses you've gotten from your work, and what's your reaction to that feedback? B3RG: I showed up to a house party to find one of my posters hanging in the house! I was so excited to see that someone had taken the time to take one down so they could have it for themselves. It was a huge compliment! People who know the posters have for the most part been very excited about the art. I have also noticed some people modifying the posters (adding sun glasses to the girl) and its cool to see how the art changes and becomes part of the layers art on the streets once they have been placed. Gavin: You've primarily based yourself in SLC, but you've started taking your work to other cities like San Francisco and New York. Are you looking to branch out into other places or is it simply just posting to see the reaction from others? B3RG: I visit San Francisco to work and learn as much as possible, all my favorite graffiti artist, painters and tattoo artists live and work there so its hugely inspirational for me. When there I try to branch out and expand the base of where I post my art. When it comes down to it I take advantage of the opportunities I am given to make art and learn from the world around me. Gavin: What's the overall goal with Berg Propaganda, and are there plans to use other forms of artwork as part of the displays? B3RG: The goal of the art I make is to add a message to the art that exists on the street and push that as far as I can. I am currently working on larger scale posters and I am always looking for new ways to add to public art. The posters began as a side project from painting, which has taken over more and more, and I would like to synthesize the two; so I am working to do more murals and canvasses that I hope will bring the two together. I feel that they can both complement each other to create something new. 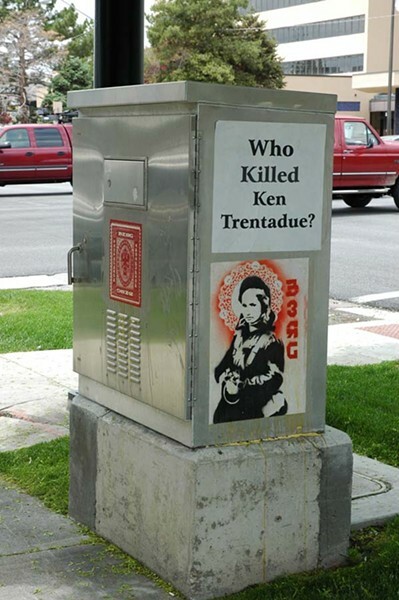 Gavin: Going more local, what's your take on the street art you've seen in SLC, both good and bad? B3RG: I have been very excited about the development of the graffiti that is showing up on a more permanent level in the city. More and more legal walls are showing up in public areas and I am seeing more and more art on the streets. 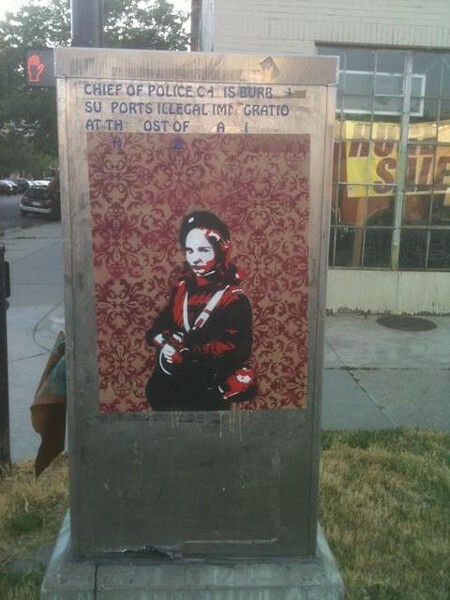 Wheat paste, legal walls, painted signs, art on the Trax lines ect. When I am in San Francisco, there is so much art on the streets that is absolutely amazing and it is adopted by the public. I am inspired every time I am out there and I feel that Salt Lake as a city is moving forward closer and closer to that. Look at the recent El Mac and Retna piece on the old Guthre building. Even though they are not local, locals brought them here, and the legal wall down by Uprok. 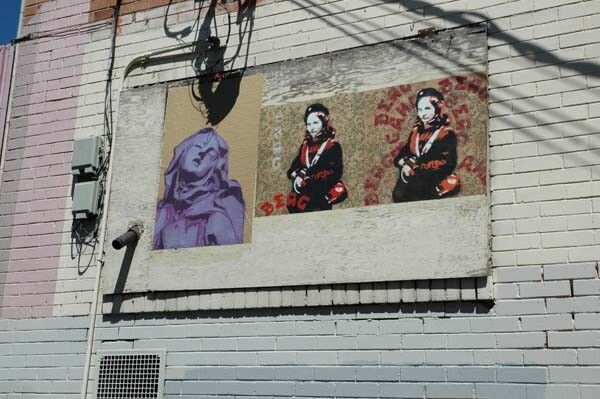 Both amazing examples of how we are moving closer to a city that appreciates street art. You can't ever escape the fact that this is a Mormon run town and there will always be resistance to the kind of art that is mostly still seen as vandalism. With that being said there is something special about making art that is rejected or criminalized in a outwardly conservative town. Gavin: Is there anything you believe those artists could do to showcase better or become noticed? B3RG: There is always more people could be doing to get noticed, you can make stickers, put up postings all over the internet, submit to magazines, print your art onto t-shirts and hoodies, ect. Every artist has to make the choice as to how they want to represent their art to the community. In the end its a matter of what is most important to you as an individual, all the rest falls into place. Gavin: What's your opinion of our art scene as a whole and the impact it has on our community? B3RG: I am honored to be part of the Salt Lake art scene. I feel recently there has been a big push forward that has been years in the making. This new generation raised on cartoons in a world over saturated with advertisement and regulation has always appreciated mischief and mayhem. It is now being translated into art forms that spit in the face of the pompous "High Art" creating a scene amazingly more interesting. The underground culture of this town is vibrant with artist of all kinds, from painters, tattooers, graffiti artists, sculptors the list goes on. Everyone has something to offer and its great to see people getting up and making art. B3RG: New posters, bigger and better! I have several already started and plans for new areas around the city. My biggest goal for now is to bring together my spray/acrylic painting with the posters for walls and canvas. I think this town needs more decorated box trucks as well! As always the struggle is to stay ahead of the clean up crews and keep art on the streets. Art always seems to evolve on its own path and its hard to foresee where it will take you, so in many ways I am on the ride to see where it takes me. B3RG: I would like to send out my appreciation for all the people making art and bringing it to the streets.